Help I Still Can’t Sleep…What Should I Do? 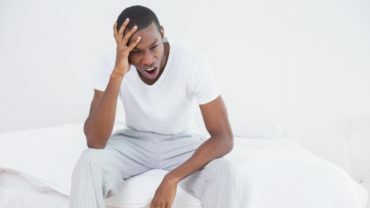 Is Lack of Sleep Dangerous? Ignoring your sleep problems could cause major issues for you at work, school or your other daily activities. Whether you realize it or not, your body needs a certain amount of sleep to function properly. If you don’t get enough sleep, your body will try to find another way to get rest and recharge itself. You may not even be aware that you have a problem. We are so used to being busy and on the go, we often fail to recognize that a lack of sleep is the problem. It’s not until the fatigue and drowsiness causes us to get sick or make a mistake that we start to pay attention. A lack of sleep can leave you feeling tired during the day, effecting your mental and physical health. If you are older, sleep deprivation is a sign that you are not sleeping enough to fully recharge your body. This pattern continues and becomes a true medical condition that requires immediate attention. Lack of sleep can also, cause you to gain weight. One of the benefits of quality sleep is that your hormone levels are regulated. When you suffer from sleep deprivation, your hormone levels can become imbalanced. As a result, your appetite may be affected. You may feel hungry when you’re not – or in some cases, not feel full when you are. Chronic sleeplessness can also lead to depression, impatience and irritability. Emotional frustration often gets overlooked and doesn’t get addressed until it negatively effect us. You may be unaware that your mood swings, emotional outbursts or breakdowns are due to sleep. You may be placing the blame elsewhere and focusing attention away from the real problem: a lack of sleep. Have you ever driven your car while drowsy? The inherent danger is obvious. And while this is a dramatic example, it’s also one that’s all too common – a powerful illustration of how important it is to get enough sleep. Getting the right amount of sleep is vital to staying healthy. It needs to be treated with the same concern and care that your other healthcare issues receive. Ignoring the signs of sleep deprivation could be harmful to yourself and others. Your life and the life of others is at risk. 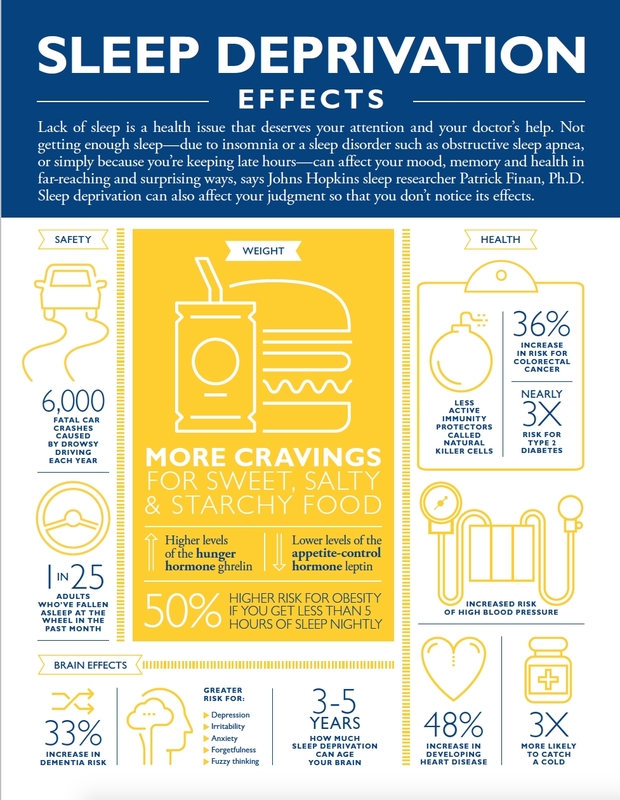 Learn how Sleep Deprivation can effect your life, checkout the info-graphic below. 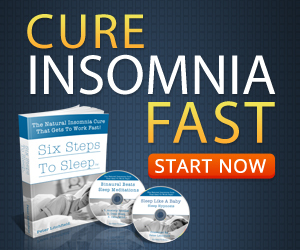 It was created by Johns Hopkins sleep researcher Patrick Finan, Ph.D. 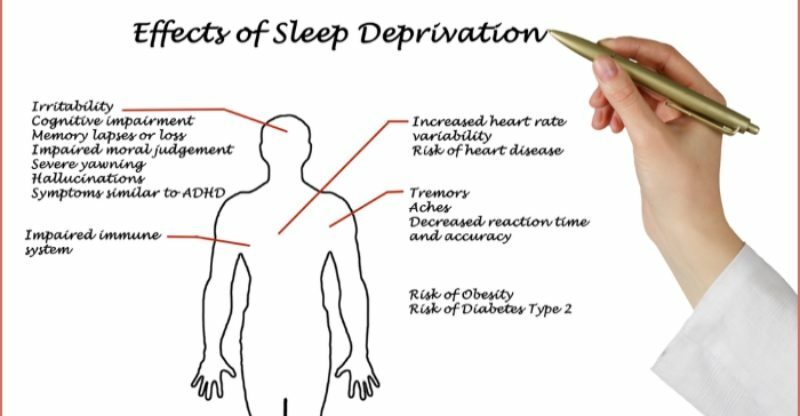 This info-graphic shows the serious results of sleep deprivation. The info-graphic is an “eye Opener”.